Outgoing White House Chief of Staff John Kelly says he was surprised by US President Donald Trump’s so-called Muslim ban despite his full-throated defense in the early days of the administration. “I had very little opportunity to look at them,” before the orders were announced, Kelly acknowledged in an interview with the Los Angeles Times. Trump issued an executive order shortly after taking office in January 2017 to suspend the entire US refugee program for 120 days and bar travelers from seven Muslim-majority countries from entering the United States. “Obviously, it brought down a greater deal of thunder on the president.” said Kelly, referencing nationwide protests held to decry Trump’s crackdown. He noted that former Attorney General Jeff Sessions’s decision to impose a “zero tolerance” immigration policy at the border was equally surprising to him. Sessions’s measure resulted in separation of children from their parents. The Trump administration has been under criticism over its “zero tolerance” towards immigration. 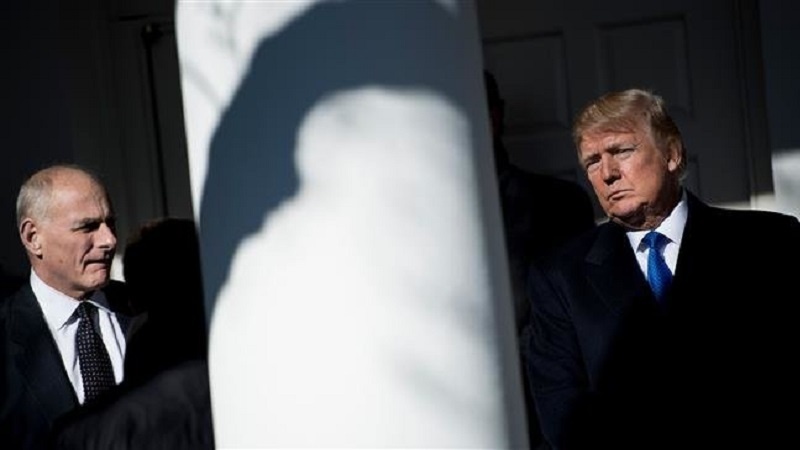 Since campaigning for the 2016 presidential election, Trump has been accused of stoking racial, ethnic and religious tensions lurking within America. “I’m guarded by the Secret Service. I can’t even go get a drink,” he said. Trump said earlier this month that Kelly would leave at the end of the year. Budget Director Mick Mulvaney has been announced as Trump’s acting chief of staff after the position was turned down by Vice President Pence’s Chief of Staff Nick Ayers and publically dismissed by North Carolina Republican Representative Mark Meadows and former New Jersey Governor Chris Christie.